Brian Fleming is a member of the law firm of Miller & Chevalier in Washington, D.C. Moreover, the public ledgers underlying cryptocurrencies may allow the U.S. government, quite readily, to investigate potential sanctions violations by identifying the details of specific transactions and parties. What follows below is a brief overview of some cryptocurrency players that could be affected and how that impact may be felt. Just as exchanges have been a focal point of increased government scrutiny regarding fraud and other criminal activities involving cryptocurrencies, they also could be the natural starting point with respect to sanctions. A greater focus on disrupting potential sanctions violators could mean that lawmakers and regulators demand greater transparency from exchanges, as well as parties that use them. Because this tension between transparency and security (or anonymity) is growing more heated, exchanges themselves are going to need to wrestle with how they reconcile those competing interests and retain their identity in the marketplace. Exchanges that choose to ignore sanctions risks could find themselves subject to major penalties in the future. Any sanctions risks affecting exchanges will necessarily flow to cryptocurrency investors, as well. Although investors themselves may not be directly in the crosshairs of OFAC—unless they have knowledge that an exchange is violating U.S. sanctions—significant penalties imposed upon exchanges could result in assets being frozen or even exchanges being put out of business. Savvy cryptocurrency investors should certainly consider sanctions and other compliance-related concerns when conducting due diligence to identify the most reliable and trustworthy exchanges. Banks are among the most risk-averse actors when it comes to sanctions. They come by that aversion honestly, as major global financial institutions have been subject to massive penalties imposed by OFAC and other U.S. enforcers in recent years. While sanctions risks associated with cryptocurrencies could be too much for more traditional banks to accept, even more forward-leaning financial institutions that have been receptive to the sector may be forced to reassess those risks. Late last month, Nordea Bank AB, which operates in Northern Europe, confirmed that it was banning all of its employees from trading in cryptocurrencies due to the perceived risks. Despite the ban, Nordea’s self-service customers are still allowed to purchase cryptocurrency products through the company’s platform, although the bank does not recommend it. Regardless of the specific reasons for the changes in policy, the inability to verify customers and counterparties—and the possibility of transacting with sanctioned parties—is precisely the type of blind spot that could lead to significant sanctions exposure for financial institutions. As cryptocurrencies gain wider acceptance among commercial businesses, especially those in the e-commerce space, those entities will need to decide what measures are necessary to protect against sanctions risks. Many U.S. businesses have adopted screening procedures to vet non-U.S. customers or counterparties and ensure that U.S. goods are not shipped to a sanctioned party or destination. How will U.S. businesses that accept cryptocurrency payments screen transactions appropriately? It is an open question whether such screening procedures can be readily adapted to vet transactions conducted using cryptocurrencies. If adaptation is too costly or ineffective, then businesses may reevaluate the benefits of accepting cryptocurrencies in the face of clear sanctions risks. There are many reasons to be skeptical of Venezuela’s petro and Russia’s cryptoruble, but sanctions should be near the top of the list. High-ranking government officials in both countries have publicly acknowledged that their planned government-supported cryptocurrencies are responses to U.S. sanctions against those countries and an effort to circumvent the reliance on U.S. currency in certain industries. In other words, these countries have admitted they are attempting to evade U.S. sanctions. With respect to Venezuela, OFAC has already made clear that such currency is essentially off limits to U.S. persons. One can imagine a similar fate may be in store for the cryptoruble should it come to fruition. Additionally, for any non-U.S. persons considering whether to use, accept, or invest in either currency, they potentially could be branded by OFAC as foreign sanctions evaders, which would subject them to sanctions, as well. 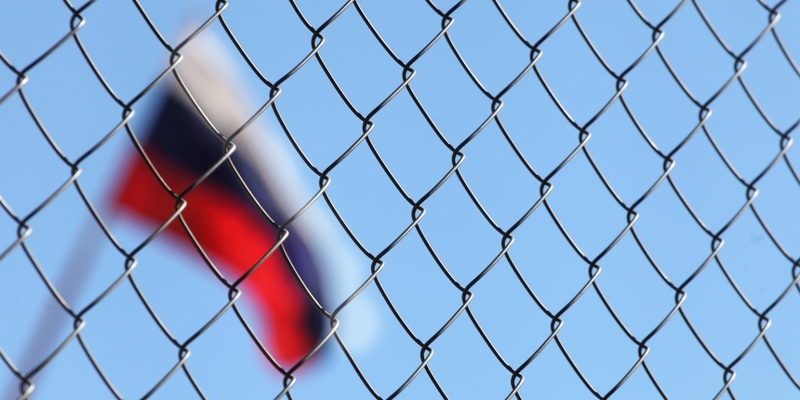 Russian flag behind fence image via Shutterstock.